​​​​​​When learning new spellings with your children, here are a selection of techniques we use in class. The common exception words in the documents below are usually the words the children have difficulty spelling as they are not phonetical. Look, say, cover, write, check: This is probably the most common strategy used to learn spelling. Look: first look at the whole word carefully and if there is one part of the word that is dificult, look at that part in more detail. Check: Have you got it right? If yes, try writing it again and again! If not, start again - look, say, cover, write, check! Trace, copy and replicate (and then check): This is a similar learning process to the technique above but is about developing automatically and muscle memory. Write the word out on a sheet of paper ensuring that it is spelt correctly and is large enough to trace over. Trace over the word and say it aloud at the same time. Move next to the word you have just written and write it out as you say it. Turn the page over and write the word as you say it, and then check that you have spelt it correctly. Segmentation strategy: The splitting of a word into its constituent phonemes in the correct order to support spelling. Quick write: Writing the words linked to the teaching focus with speed and fluency. The aim is to write as many words as possible within a given time. Drawing around the word to show the shape: Draw around the words making a clear distinction in size where there are ascenders and descenders. Look carefully at the shape of the word and the letters in each box. Now try to write the word making sure that you get the same shape. Drawing an image around the word: This strategy is all about making a word memorable. It links to meaning in order to try to make the spelling noticeable. This can't be the main method of learning spellings, but it might work on those that are just a little more difficult to remember. Words without vowels: This strategy is useful where the vowel choices are the challenge in the words. 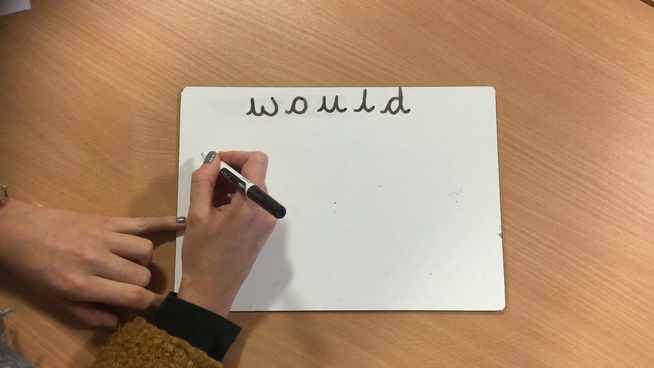 Write the words without the vowels and pupils have to choose the correct grapheme to put in the space. Pyramid words: This method of learning forces you to think of each letter separately. You can also reverse the process so that you end up with a diamond. Mnemonics: This strategy involves making up memorable 'silly sentence' of which the first letter of each word spells the common exception word. Rainbow Writing: Using coloured pencils/ pens in different ways can help to make parts of the words memorable. You could highlight or write the tricky part in a different colour. Making up a 'silly sentence' which contains the word. Saying the word in a funny way.